Immediately following the fire and abandon ship drills, we proceeded to have a debriefing regarding appropriate and professional behaviors, as well as, receiving information regarding shift schedules, meals, work expectations, etc. Our Chief Scientist, Victor Nordahl, informed us of the various duties and responsibilities each of us would have during the Sea Scallop Survey. 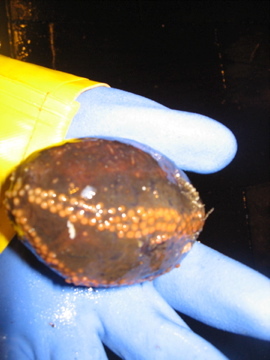 I was paired with another volunteer, Shawn, to help with the measuring of the sea scallops once they were sorted and weighed. 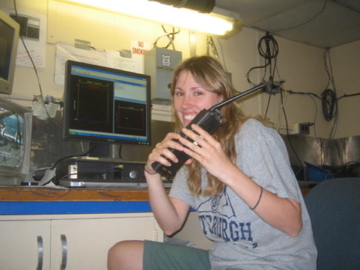 I was also assigned the role of performing CTD casts and collecting data from the inclinometer.CTD casts are performed at every third station. The acronym stands for conductivity, temperature, and depth. It is a hefty contraption that is hooked onto a cable and sent down, a vertical cast, into the water. 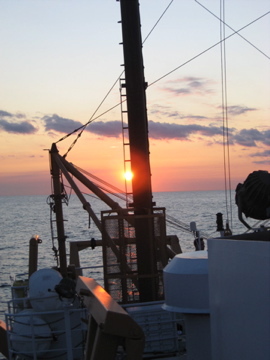 Basically, while the CTD is sent down vertically, it records the temperature, depth, salinity, and pressure. 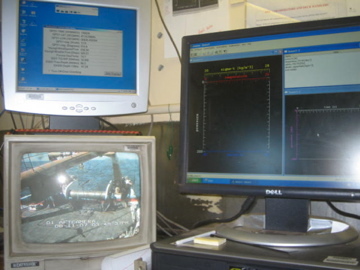 The saltier the water, the more conductivity is generated. The cast first soaks for about one-two minutes at the surface of the water to record the salinity. 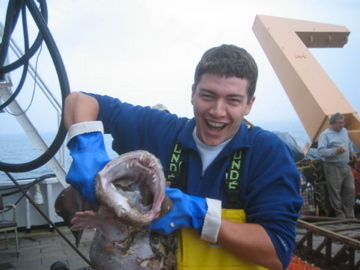 It is then sent down, stops about 5-10 meters before reaching the bottom of the ocean floor and then is hauled back. 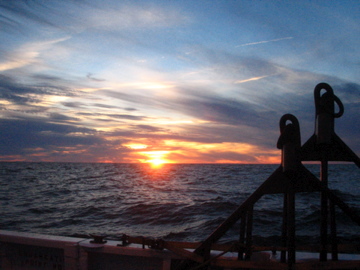 Recording this data is essential for scientists, especially while conducting a Sea Scallop Survey; because the CTD casts helps to associate water temperature and salinity with sea scallop abundance. 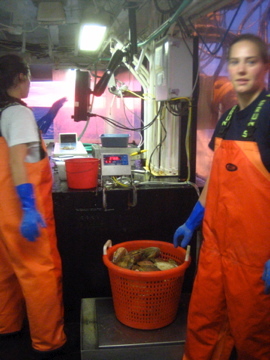 Scientists record the data to view it later and assess the casts with the other data collected from the work stations. It is then time to get to work. Each of us works in 12 hour shifts. We are either designated to a noon-midnight shift or visa-versa. First, the winch operator sends out the dredge. It trolls in 15 minute increments and collects everything that it encounters along the way. 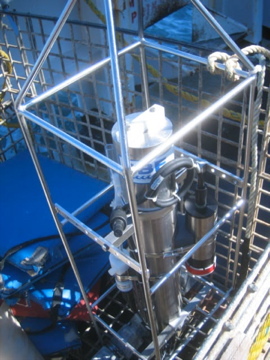 This includes various marine life, vegetation, and bottom sediment like rocks and sand. 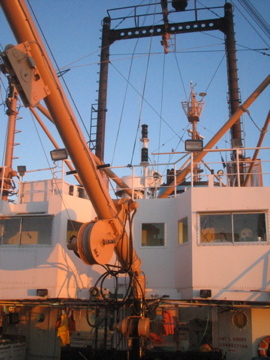 Once it is brought to surface the deck handler’s work with the winch operator to lower the dredge to the middle of the stern. The dredge is emptied of its contents and then it is our turn to sift through it. The marine life is sorted into blue buckets according to their species. Our Watch Chief teaches us how to identify them, especially when sorting Winter versus Little Skates or Winter versus Yellow-Tail Flounders. We put all of the scallops into large orange baskets. 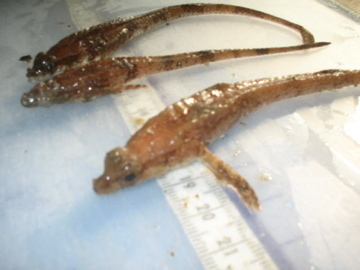 The species are then weighed and measured. We work in pairs and each pair is assigned to one of the three work stations. 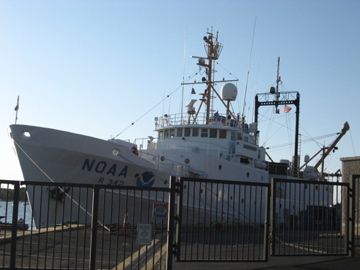 The data is recorded into the FSCS, which stands for Fisheries Scientific Computer System. 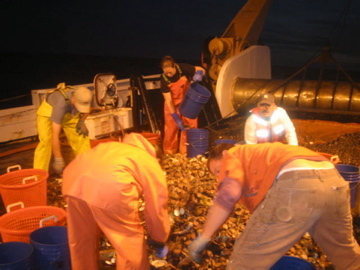 Some of the scallops are frozen for further scientific investigation while the others, as well as the other marine life collected from the dredge are put back into the water. The buckets are washed and stored for the next tow, which occurs every 45 minutes as we wait to reach the following station. I am learning so much and I can’t wait to bring all of this information back to my students. My next log will discuss the diversity of the marine life here along the Georges Bank and Nantucket Shoals, as well as, the purpose of the FDA sending employees to test for PSP (Paralytic Shellfish Poison) within the meat, viscera, and gonads of the sea scallops. 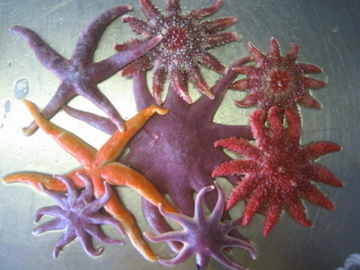 What preys upon sea scallops besides starfish? How are the open and closed waters designated and determined? 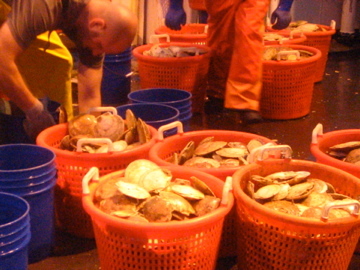 What is the impact of scallop fishing on the overall ecosystem? The best thing about working 12 hour shifts are the sunsets! 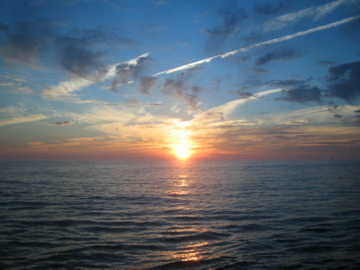 Sunsets along the Atlantic Ocean have been positively beautiful. 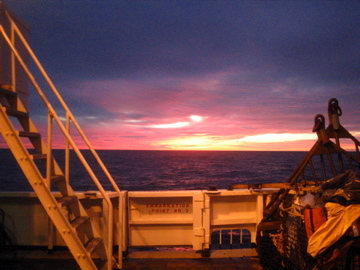 The weather has shifted drastically while on board the ALBATRSS IV. Initially in the voyage the weather was cold, foggy, damp, and windy. 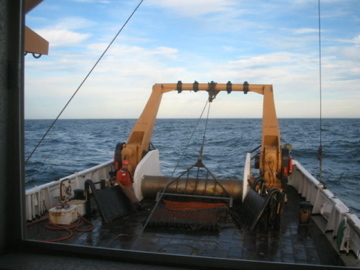 The visibility was difficult, as well as, balancing myself with the continuous rocking of the vessel. Quite a feat! 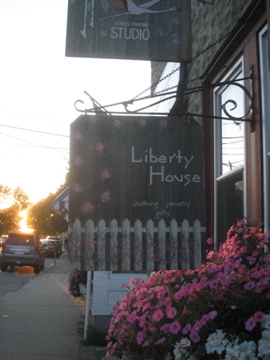 Recently the weather has been gorgeous: fair skies, very warm, with a rewarding breeze. My partner, Shawn McPhee, and I have developed quite a rhythm for measuring the scallops and cleaning up. We have even “graduated” to measuring many other species in order to help expedite the process and allow enough time for our Watch Chiefs to focus, more importantly, on collecting other sorts of data during each tow. 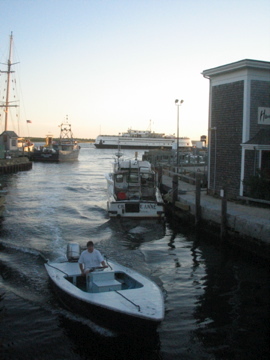 I arrived in Woods Hole, MA on Sunday August 5th, 2007. The ALBATROSS IV was scheduled to depart early Monday morning, but we were unfortunately delayed a couple of days as a result of waiting for some diesel oil and fresh water shipments to arrive. 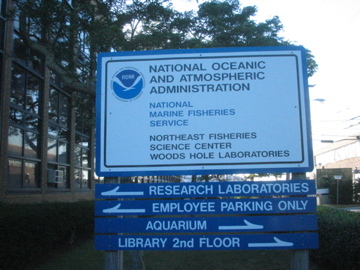 During our delay we took a tour of the NOAA Aquarium right there in Woods Hole, MA. 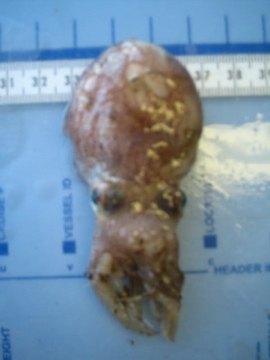 We started to become more acquainted with some of the species we would encounter while on the survey. We set sail early Tuesday afternoon. I stood at the stern of the vessel watching the landscape fade away into the foggy mist. 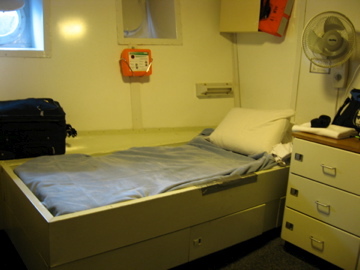 Once on board and steadily sailing north bound, a few procedures and protocols were immediately rehearsed. The first procedure was a fire drill. As the alarm sounded, we quickly retrieved life jackets and a large orange tote containing a wet suit from our rooms and proceeded into the “wet lab” where we waited for the following instructions. 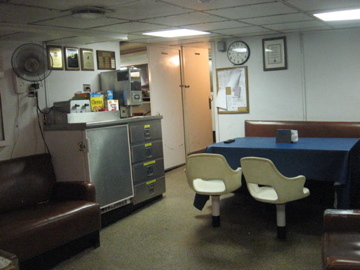 Afterwards, an abandon ship drill was announced. The entire crew congregated at the stern of the vessel. Each individual had to rapidly unpack the survival suit from the large orange tote. We had to slip into the red immersion suits, which proved to be a bit difficult for me to maneuver. However, hopefully in the event of an actual abandon ship emergency, I would be much more successful at putting them on. They certainly provide enough protection in case of an emergency.